Nuffield Research Placement Scheme – register your interest now! Every year, The University of Manchester hosts sixth form students participating in the Nuffield Research Placement scheme. The placement is a brilliant way of working with talented young people from local schools who are interested in academic research, and who meet our widening participation criteria. Register an interest: We are looking for staff and Early Career Researchers who would be willing to host a Nuffield Research Placement student in July or August 2019. The student will work with you for 4 weeks on a project of your choice. Who is it for? Staff and Early Career Researchers who are interested in offering a project in any area of STEM or quantitative Social Science. Manchester Museum is looking to recruit PhD students to deliver educational sessions for their Secondary (11-16 year olds) and Post-16 (16-18 year olds) programmes. The aim is to utilise PhD student’s expert knowledge to enrich the student experience for our formal school and college visitors and provide PhD students with the confidence and training to share their research in a wider forum. This will be a paid position for the delivery of education sessions (which includes set-up and clear-away time where applicable) as they are booked by schools and colleges. Delivery of sessions will be on a casual basis depending on demand. Demonstrators will receive full training in communication, facilitation (incl. classroom management) and session-specific skills before being requested to deliver any sessions. Further details of roles, responsibilities and payment will be given on enquiry. Once again the University of Manchester will be taking part in the national Three Minute Thesis (3MT) competition. 3MT challenges doctoral candidates to present a compelling spoken presentation on their research topic and its significance in just three minutes using just one static PowerPoint slide. In the UK, the 3MT national competition final is hosted by Vitae. Individual UK universities run their own competitions and put forward one winner per participating institution for the national finals. The University of Manchester is one of around 40 institutions participating in 2019. 3MT develops your academic, presentation, and research communication skills and supports the development of your capacity to effectively explain your research in language appropriate to a non-specialist audience. You will have access to exclusive 3MT presentation training. Open to all active second and final year PhD candidates (including candidates whose thesis is under submission) by the date of their first 3MT presentation in the heats. You must be able to attend at least one of the scheduled Heats and, if successful, the University Final. Read the full set of rules and the judging criteria. Applications will officially open on February 1st 2019. To receive a link to the registration form and further details by email on this date please contact me (alex.hinchliffe@manchester.ac.uk) to register your interest. *prizes are paid in Amazon vouchers. Fun palaces coming to a library near you! 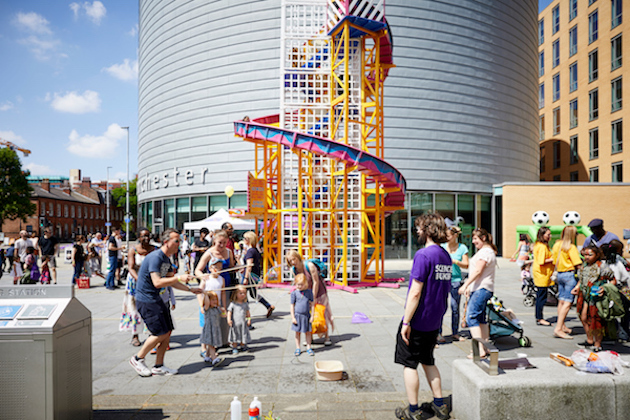 Fun palaces are a way of bringing together Art, Science, local community and FUN!! Have you got a skill, hobby, interest or burning passion that you’d like to share with others? Are you an enthusiastic cook? Can you share the science or art of cooking? Maybe you’re a mathematician and you’ve got some fun number science to share? Are you an artist, traditional or contemporary, realistic, abstract using watercolors, pencils, inks or digital tools? We want to invite you all and more besides to come and share your skills with others in our participating libraries on Sat 6 October. Activities could include, crocheting, knitting, drawing, math, astronomy, astrology, mechanics, coding, raspberry pi’s, Arduinos, microbits, cooking, sports science – how best to kick a football, fractals, Minecraft, quantum physics??? And much, much more. As long as it’s got a science or arts angle, (which more or less covers everything right? ), we want to hear from you. If you’re interested in getting involved email Alison, Leigh, Paula or Siobhan with the best way to contact you and an idea of what you’d like to do. We’re really excited to hear from you!